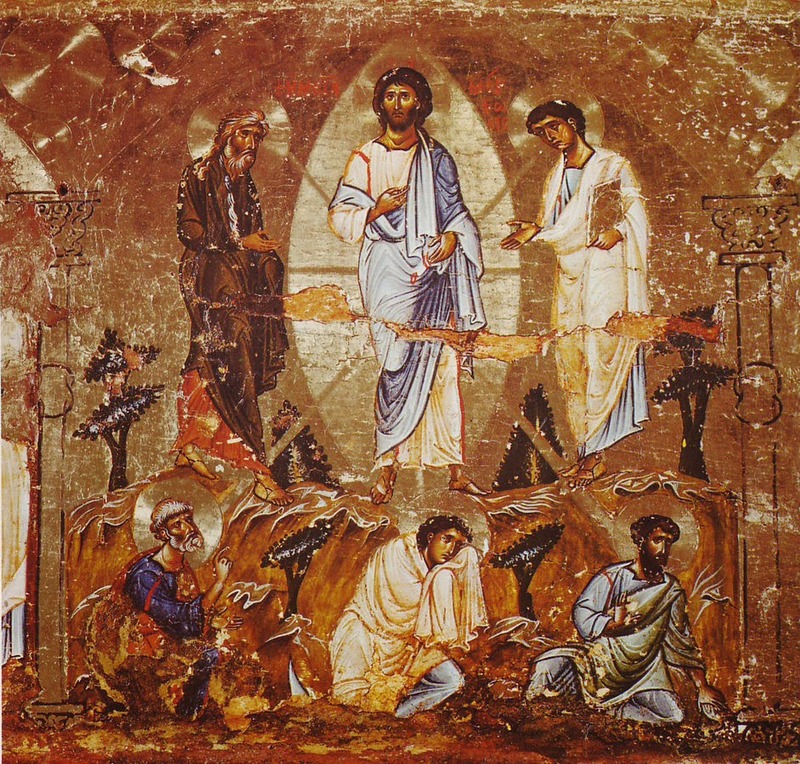 In the traditional Christian worship calendar, February 15, 2015 is celebrated as Transfiguration Sunday. Following is a sermon written for that day. It addresses the stunning reality of Jesus and our life in him. 2 After six days Jesus took Peter, James and John with him and led them up a high mountain, where they were all alone. There he was transfigured before them. 3 His clothes became dazzling white, whiter than anyone in the world could bleach them. 4 And there appeared before them Elijah and Moses, who were talking with Jesus. 5 Peter said to Jesus, "Rabbi, it is good for us to be here. Let us put up three shelters—one for you, one for Moses and one for Elijah." 6 (He did not know what to say, they were so frightened.) 7 Then a cloud appeared and enveloped them, and a voice came from the cloud: "This is my Son, whom I love. Listen to him!" 8 Suddenly, when they looked around, they no longer saw anyone with them except Jesus. 9 As they were coming down the mountain, Jesus gave them orders not to tell anyone what they had seen until the Son of Man had risen from the dead. This passage sits in the midst of a section book-ended by miracles of healing blindness. The question is this: Do you see? Peter, James and John were walking with Jesus. They were not blind to his presence. Yet still they did not see him fully. A "fog" that obscured their vision. So Jesus asks them in Mark 8:27: “Who do people say I am?” This question was really for them—“Guys, who do you see me to be?” Peter answered, “You are the Christ”—the promised Messiah, the deliverer (8:29b). Peter saw Jesus to a point, yet not fully. Reality still eluded him. So Jesus tells them in 8:31-38 that he must suffer, be rejected and die; though in three days he would rise. What was Peter’s response to this stunning revelation? “No way Master! !” (8:32b). Jesus’ reply? “Get behind me Satan! You do not have in mind the things of God, but the things of men” (8:33). …"I tell you the truth, some who are standing here will not taste death before they see the kingdom of God come with power." The message is this: you think you see, but you don’t yet see the unseen reality of who I truly am. And so Jesus takes Peter, James and John up a mountain and there Jesus is transfigured—the word is metamorphosed. Jesus morphed—his clothes were shining with a stunning radiance. And Luke adds, “the appearance of his face was altered” (Luke 9:29). Yet it was still Jesus—but now seen in the fullness of his glory—a glory that would be revealed in his resurrection from death. These three disciples were getting an advance glimpse of a now hidden reality—the true identity of this Jesus: Man, yet, God. God in the flesh. And to help make clear this reality to these three young Jewish men, the scene changes and there standing with this glorified Jesus is Elijah and Moses—chatting away with Jesus. God is messing with these men’s Jewish categories. They were accustomed to seeing reality through the lens of the Law and the Prophets—of Moses and Elijah—the great heroes of Judaism. And Jesus is quite at home in this rather august company. But Peter is beside himself, and doesn’t know what to say or to do. The best he can come up with is this: “Rabbi, it is good to be here.” Huge understatement!! But talk is cheap, so Peter quickly adds: “Let us put up three shelters”—the Greek is “skene” which means tents. Peter thought the Feast of Tabernacles had arrived, and that meant erecting tents (booths) to celebrate God’s presence and provision in the wilderness with his people. Peter was seeing, but not seeing. Reality was right in front of him, but he didn’t get it. Yet. So God ups the ante, and a cloud appears—perhaps a reminder of the cloud by day appearing to Israel, or the shekinah glory in the Holy of Holies. This is clearly a holy moment. And then the scene changes again; and now Moses and Elijah are gone. Peter, John and James see only Jesus. Talk about healing blindness--opening eyes to see reality! And, of course, it would not be until they encountered the risen Jesus that they would see him again in the full radiance of his true identity as Son of God and Son of Man. And with that unfolding revelation, these young Jewish lads had all of their hopes, dreams, and expectations altered. When you truly see the reality of Jesus, everything changes. If there is one thing that describes the journey of the church in reformation, it is the unfolding of the revelation of Jesus. The Spirit moves with power in the church to reveal Jesus more fully. The Spirit speaks to those who know something of this Jesus, but whose understanding is clouded. Perhaps they are enamored with other things - things like Moses and Elijah - the Law and Prophecy. The Spirit takes such distracted ones and holds out to them new categories, new hopes and a new - renewed vision. Those who have eyes to see, now see with greater clarity. They behold, perhaps for the first time, a reality formerly obscured to their vision and experience. 4 The god of this age has blinded the minds of unbelievers, so that they cannot see the light of the gospel of the glory of Christ, who is the image of God. 5 For we do not preach ourselves, but Jesus Christ as Lord, and ourselves as your servants for Jesus' sake. 6 For God, who said, "Let light shine out of darkness," made his light shine in our hearts to give us the light of the knowledge of the glory of God in the face of Christ. We see in Jesus—in his face; his person—the glory of God. For he is God—God in eternal union with all humanity through the permanent incarnation of the Son of God. “Who do men say I am?” Jesus asked Peter, John and James. “Well,” answered Peter, “you are the Messiah.” A correct answer—but short of the full truth. Later Peter would see Jesus for who he truly is when he was given the illumination of the Spirit, who opened his eyes to understand who he stood next to when he encountered the risen Jesus. It was then that Peter would say, together with doubting Thomas and the other eye-witnesses, “My Lord and my God.” Fully God and fully man, now glorified. This is the reality of who Jesus truly is. 16 …We do not lose heart. Though outwardly we are wasting away, yet inwardly we are being renewed day by day. 17 For our light and momentary troubles are achieving for us an eternal glory that far outweighs them all. We have seen that glory in the face of Jesus. We can never turn away, despite the hardships. 18 So we fix our eyes not on what is seen, but on what is unseen. For what is seen is temporary, but what is unseen is eternal. May God give us eyes to see Jesus the eternal one - may we see him in all his glory. And with that revelation, may we be given a heart to share what we see with others. Thank for posting your Transfiguration Sunday sermon, Ted. This is a very encouraging gospel message.